I’m trying to decide if I wanted to like this more than I did, or if a liked it more than I wanted to. It’s confusing. 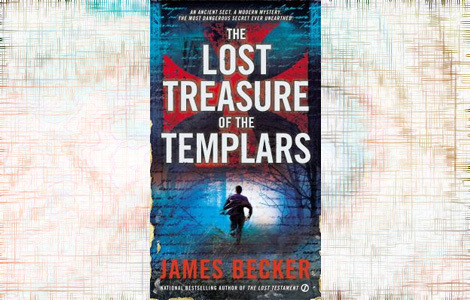 With characters in mind, I was pleasantly surprised with how The Lost Treasure of the Templars started out. Robin Jessop is the main character, a twenty-something woman running a rare book shop. She knows it’s not a profession most young women get into, but she enjoys it. She’s not worried at all about treasure or international conspiracies, or even history for that matter, when she comes across an old book that isn’t even a book at all and houses a coded scroll. It piques her interest because the unique object and scroll might both be valuable to a collector. She contacts a current client who has shown interest in such things to help her figure it out. David Mallory is a computer encryption expert who’s been researching his family tree. He can’t help but be drawn in to what Robin has found, so he decides to take a few days away to visit and help her out. I thought this was a reasonably fresh idea. Essentially two normal people, not cops or archeologists or famous experts in anything, who stumble upon a mystery. In fact, the best part of the book is the first third, where Robin and David sit around the artifacts, discussing real ancient encrypting techniques as they try to decrypt the scroll. There’s an interesting angle on history there and the author plays it out well. The characters feel real enough and the situation plausible. Then the militant religious order with a global reach drops by, as they must in all these novels. That’s where things break down. Suddenly, there’s two-hundred pages of chases and gun fights and almost zero plot development. The mystery is put on hold, and when it does come back, it treads the same ground and goes nowhere. The characters development stops, then starts going off in wildly implausible directions that left me feeling like the author dropped them in there simply as an excuse for certain things to happen. Welcome to The Lost Treasure of the Templars.